Brad Goldman has never let cerebral palsy prevent him from being an artist. 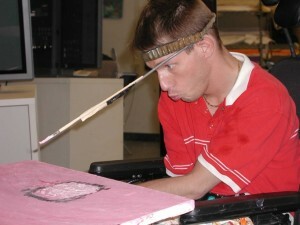 Using a personal computer and a head pointer, he paints and creates greeting cards. In fact, Goldman has his own greeting card company, BRADesigns. Now 41, Goldman was enrolled in the Matheny School when he was 2 years old. He lives in the community and attends Matheny’s Adult Medical Daycare program. Although unable to speak, he communicates by using a Dynavox, an electronic augmentative communications device. And he converses by eye-gazing on a manual communications board. Goldman began painting when he was 10 years old, and his first inspiration, “came when my father bought roses for my sister, and I painted them. My parents, artists themselves, would paint with me.” After seeing his work, someone at Matheny asked Goldman to produce a Christmas card. That blossomed into BRADesigns, which began in 1994 with the help of his parents. While Christmas is his big season, Goldman is busy right now producing Easter, Mother’s Day and Father’s Day cards. For more information, log onto www.bradesigns.com. This entry was posted in Uncategorized and tagged Brad Goldman, BRADesigns. Bookmark the permalink.